There are many ways to get involved, from attending a Sunday Service to reaching out and growing your beliefs. Albany Unitarian Universalist puts the power in your hands to grow at your pace. Get Involved at Albany Unitarian Universalist! Stay connected! Sign up to receive Windows Weekly, our weekly email newsletter and central source for news and updates. GTS is about tapping into what connects you to Albany UU. We want to learn about you so that we can help you connect and collaborate in ways that mean the most to you. And we want to celebrate all that you bring to Albany UU. For more information or to get involved, call the church office. Circle Dinners provide the opportunity to socialize over a delicious potluck dinner in a private home and become better acquainted with fellow UUs. Everyone is welcome, singles and couples alike, regardless of dietary restrictions. We can also provide rides, as needed. Watch our publications for the next dinner date and sign-up information. Circle dinners are hosted approximately four dates per year, at multiple locations. Multi-generational Potlucks: Friday night potlucks for all ages are scheduled once a month from September to May, and are held in Channing Hall. Different committees or programs step up to host each dinner, and often present an event, film, or discussion after the meal. You can either bring a dish to share or pay a nominal fee instead. Depending on the after-dinner activity, child care may be provided during the program. Walker Book Club: We offer a potluck supper and book discussion on the second Sunday of every month at 5:30 p.m. in Channing Hall. Check out Windows Weekly to find out what the upcoming book title and dates are! UU Weekend at Silver Bay: An October weekend retreat for UUs across the Hudson Valley. Lifespan Learning classes are offered throughout the year; check our publications for upcoming offerings. Mindfulness Meditation on Sundays at 9:00 a.m., and two or three two-day workshops during the year: beginners welcome. All Sides Considered: This group explores liberal and conservative viewpoints in considering current social and political issues. These take place on the first and third Thursday of every month at 1:00 p.m.
Bridge: Beginners are welcome at our social bridge games, which take place on Tuesdays at 1:00 p.m.
Choir: The Music Program welcomes all who want to sing. The choir rehearses most Wednesdays at 7:00 p.m., and performs approximately three out of every four Sundays. Green Sanctuary Committee: This committee works on environmental and energy issues within the church, and in the community at large. It meets on the forth Sunday of month at 11:45 a.m. Philosophy Group: This informal discussion of everyday ideas in everyday language takes place every Tuesday at 10:00 a.m. Projects & Quilts: Get together to crochet, knit, embroider, and quilt, either for personal use or for a group project to benefit Albany UU. This takes place on Wednesdays at 10:00 a.m.
Social Responsibilities Council (SRC): SRC coordinates and informs the congregation on social issues, takes action on position and policies of the Society and collaborates with other organizations in the community on issues of social concern. SRC welcomes all interested persons to its meetings every third Sunday of the month at 11:45 a.m. (September through June – unless there is a conflict) and to take part in its activities. 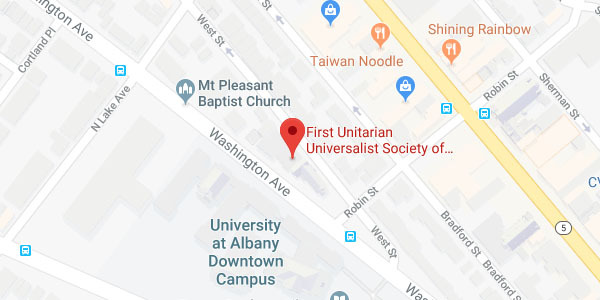 UU Humanists: Conversations about Humanism in Unitarian Universalism happen on the third Tuesday of every month at 7:00 p.m.
Do I need to become a member to participate in events at Albany UU? The short answer is all services, activities, and meetings are open, and you are welcome to attend!